Join us to learn about recent analyst research and real-world use cases to help you better Operationalize Threat Intelligence. Jon Oltsik, Senior Principal Analyst at Enterprise Strategy Group (ESG), will set the stage with research results on the state of the threat intelligence market. Jon and A.J. Shipley, VP of Products at LookingGlass Cyber Solutions, will then dive into a lively discussion on the role of threat intelligence in incident response, securing the perimeter, supply chain management, and compromised credentials. Key use cases will include closing the gap in DNS, leveraging APIs for SIEM, addressing protocol-specific infrastructures, and much more. Sign up today to ensure you receive all the valuable insights, strategies, best practices and key use cases on operationalizing threat intelligence to help improve your organization’s cybersecurity posture and lower risk. As we move toward the halfway point in the year, it might be a good time to evaluate the effectiveness of your organization’s security posture. According to CyberEdge’s 2019 Cyberthreat Defense Report, 78% of enterprises were victimized by a successful cyberattack last year. Is your organization next? -What are the weakest links in current security postures? -What’s standing in the way of IT security professionals? -What are the hottest security technologies for 2019? All webinar registrants will receive a complimentary copy of CyberEdge’s 2019 Cyberthreat Defense Report. Register now! This webinar delves into how one of the world's top financial services firms developed and implemented a robust threat model capable of repelling the world's most sophisticated hackers and nation-state actors. Join LookingGlass Product Manager, Dan Martin, and Security Ledger Editor-in-Chief, Paul Roberts for an introduction to ScoutThreat™, a threat management platform that helps security analysts streamline threat analysis work and extract the maximum value from threat intelligence. It’s 2018 – why are we still manually blocking firewall ports, manually ingesting threat feeds, and manually implementing blocks from well-known, trusted sources? Automation and integration allows security professionals to keep up with the pace of today’s threat landscape. The two go hand in hand but are they right for every organization? What would it take to manually do what automation does? How do I get actionable threat intelligence? Traditional cybersecurity leads with a “block & tackle” strategy. But as threats become more complex, targeted, and sophisticated, security operations centers (SOC) require a better understanding of how threats beyond the perimeter interact with their network. Join IDC special guest, Research Director Chris Kissel and LookingGlass Product Manager Brandon Dobrec in a discussion on modern-day SOC needs for a threat platform that marries automated intelligence tradecraft with the human element. In the highly dynamic online landscape of misinformation, fake news, gossip, and the trading of absconded data, organizations must expand their cybersecurity arsenals in protecting their brands, personnel, facilities, and sensitive information. They must take into account what exists outside the perimeter in the greater cyber ecosystem: the surface, dark, and deep web. Locating and assessing these threats, however, is a challenge for even experienced threat hunters. The tools and techniques are non-standard. You should ask yourself, “Is my security team ready to tackle what lies beyond the perimeter?” If not, let us shed light on this topic. Register for LookingGlass' "Threats Beyond the Perimeter" webinar on Tuesday, July 17 @ 2 pm ET to hear Michael Suby, VP of Research at Frost & Sullivan and James Carnall, VP of Customer Support Group at LookingGlass discuss how these scenarios may affect your brand, employees, and facilities. Cyber threat intelligence – when properly gathered, refined, and applied – can help organizations identify business risks and target both protections and mitigations. But what distinguishes high-quality and actionable threat intelligence from low-quality security "noise"? How are cutting edge CISOs and IT security teams applying threat intelligence to respond to incidents and slam shut windows of compromise? Find out in this webinar moderated by Paul Roberts, the Editor in Chief at The Security Ledger. Paul will be joined by LookingGlass’ Brandon Dobrec, and counter threat intelligence & vulnerability research expert Chris Roberts. Together they will review the value of threat intelligence to organizations, discuss how cutting edge firms are using threat intelligence to their advantage, and review how to orchestrate threat intelligence to automate mitigation and combat third party risk. Tune in on Tuesday, June 26 @ 1PM ET!! Hundreds of thousands of fans and their personal devices. Increased political tension. International boycotts. What is at stake at the 2018 FIFA World Cup? This webinar will examine the cyber and physical risks surrounding this year’s upcoming World Cup in Russia including the likelihood of a large-scale cyber attack and a simulation of how a possible attack might play out – how it could be launched and the steps to taken to ameliorate the effects. Join LookingGlass’ Sr. Director of Investigation, Olga Polishchuk, and special guest speaker Rob DuBois of Impact Actual on Wednesday, June 6 @ 9am ET/ 2pm GMT as they explore elevated threats that may play out during one of the world’s largest and most treasured sporting events. Register now! Phishing, ransomware, and data breaches plague organizations of all sizes and industries, but the financial services market has always had the largest target on its back. As a mid-market financial organization, how do you fend off these attacks when you don’t have the budget for everything you need: data feeds, tools, analysis and mitigation? The answer: “Threat Intelligence-as-a-service.” This, robust, cost-effective option, brings together dozens of structured threat intelligence feeds, online monitoring of social media and the dark web, and round-the-clock human review to give you vetted, relevant intelligence specific to your organization. Even better, there is no hardware or software to install, this is a completely managed service that can be up and running in hours or days. It finally puts “big bank” threat intelligence capabilities within the reach of smaller organizations. Join LookingGlass’ Vice President of Customer Support James Carnall and Vice President of Intelligence Operations Eric Olson on Wednesday, March 21 @ 2pm ET as they discuss how threat intelligence can be affordable for mid-market organizations with LookingGlass’ Information Security-as-a-Service package, a new offering tailor made for your organization’s cybersecurity needs. Threats in today’s cyber landscape are becoming increasingly sophisticated. To successfully fend off attacks, organizations need security tools that work effectively and efficiently across vendors; however, it is not uncommon for one vendor’s products to not work with others, despite claiming support for standards. In this webinar, we will introduce some of the key challenges a heterogeneous integrated security environment must solve and how STIX/TAXII2 standards-based technologies support solving those challenges in a new and effective manner. Our webinar with LookingGlass’ Senior Directors of Intelligence, Olga Polishchuk and Jonathan Tomek will explore how you and your security team can benefit from finished intelligence, including insights into key topics like policy, high-profile events, and threat trends. Whether you need to know more about international business law or want to a specific threat actor’s profile, having strategic intelligence at your fingertips can help keep your organization safe from cyber and physical threats. Join us on February 21 @ 2PM ET to learn how you can enable your security team to make better tactical and business decisions. 2017 was filled with cybersecurity meltdowns. From WannaCry to BadRabbit, the cybersecurity landscape has only become more volatile. With cyber threats on the rise, is your organization’s security posture ready for 2018? Security organizations face numerous challenges, from increasingly large volumes of data and lack of tools and trained staff, to validate intelligence to the inability to operationalize threat intelligence. What’s required is a solution that addresses their business needs at every stage of the business cycle. By now, the majority of us have likely been inundated with stories about third party data breaches and how one vendor’s vulnerability can cost your organization millions. But how do you know if you’re doing enough to stop third party risk? As we enter 2018, new U.S. and European cyber regulations are going into effect, and organizations can no longer check the box when it comes to their vendors’ cybersecurity. You are not only liable for knowing where you are most at-risk, but now you must also understand how that risk affects your organization and identify a solution for mitigating that risk. This series describes a comprehensive “business technical approach” to the justification, definition, design and execution of Threat Intelligence Programs. What do we mean by “business technical approach’ to Threat Intelligence? Much in the industry is focused solely on one technical aspect or another of threat intelligence data that indicates information about a specific malware family, a set of indicators that can be used to block malicious sites, campaign information that highlights a threat actors profile, their tactic, techniques and procedures. But much of the technically focused content do not discuss how organizations can gather or construct that information themselves, and even more so, how an organization would organize themselves to respond to such data. Much of the output of the industry is providing the fish to organizations rather than teaching the organizations how to fish themselves. A ‘business technical approach’ is one where we define an approach focused on the business needs, the organization personnel, organizational roles & responsibilities, team structure and those elements’ interaction with technology to address the challenge of successful threat intelligence operations. Our goal is to help organizations build effective Threat Intelligence programs. With Part 2, we introduced the overall vision of a successful TI Program. In this webinar, we dig into the key elements of the TI program with concrete examples, and key components of the program that must exist including the right team, process, tools, metrics and connections. In Part 1 of the CSO Series we introduced the key business and technical requirements of TI programs. In Part 2 webinar we will examine some important definitions to consider in TI and how to start building the program based on the requirements identified in Part 1 of the series. We will introduce to the audience the overall vision of the TI program execution, doing gap analysis on existing security programs and identifying where the TI program can complement and enhance existing investments. A ‘business technical approach’ is one where we define an approach focused on the business needs, the organization personnel, organizational roles & responsibilities, team structure and those elements’ interaction with technology to address the challenge of successful threat intelligence operations. In Part 1 we will examine what drives CISOs and organizations to consider adoption of a threat intelligence practice. CISO’s are focused on Risk reduction to their organizations but may not have a fully defined set of requirements on who, how, where Threat Intelligence can assist in that high-level goal. They may require a solid business case to justify the investment and have a supporting set of well-defined business and technical requirements. Some key questions help formulate the executive’s plan. -What are the costs of solving these requirements? -How can my organization’s revenue be protected while investing in TI? -What is the right balance of both tactical and strategic Threat Intelligence-driven responses? -Where can existing investments be leveraged? sophisticated global organizations, government agencies, and multinational banks are routinely penetrated and taken offline by cyber criminals, how can a concerned enterprise quickly and cost-effectively evaluate their own risk? The current number of active cyber threats is astounding. Do you know which threats are targeting you right now and which threats are likely to cause greatest harm to your company? This session examines how correlating network flow data with cyber threat information during incident response provides knowledge of not only what threats are active or targeting you, but which of your assets are being targeted before or during an incident. We examine the many data types used in commonly-shared indicators of compromise and explore which provide for automating correlation with network flow data. The pros and cons of common correlation algorithms are discussed with a focus towards their contributions and limitations to enhancing threat intelligence efforts. Proper network flow correlation should provide a foundation for performing risk-based mitigation that identifies the threats that are creating the greatest loss of value for your organization rather than chasing down the threats deemed most harmful by the industry. 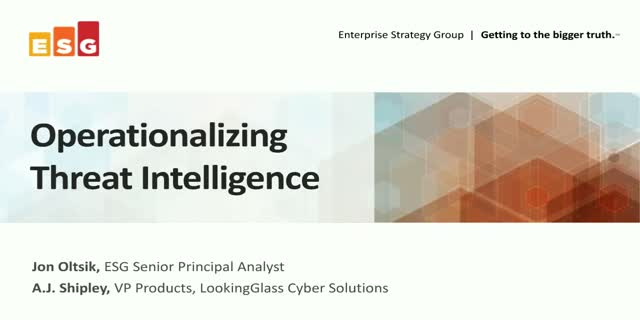 LookingGlass Cyber Solutions delivers comprehensive threat intelligence driven security through a scalable solution portfolio of machine readable threat intelligence (MRTI), threat intelligence management with 140+ data sources transformed into global Internet and threat intelligence, threat intelligence services, and network threat mitigation. and open source data (OSINT), internal network telemetry, and network threat mitigation, customers gain unprecedented understanding into threats that may impact their business including cyber, physical assets, and third party partners. Prioritized, relevant and timely insights enable customers to operationalize threat intelligence in an effective and efficient way throughout the threat lifecycle.